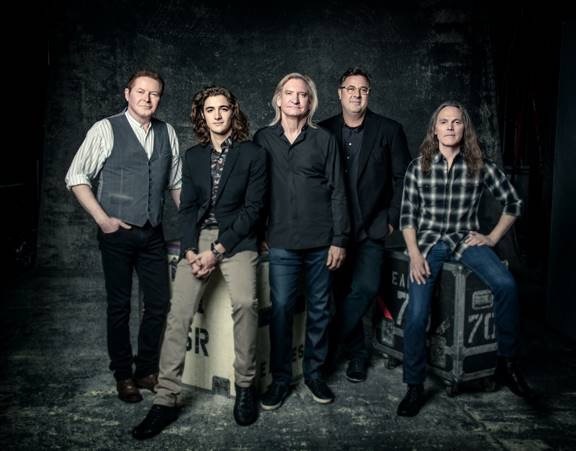 The Eagles’ much anticipated tour made a stop in Charlotte on Wednesday night at the Spectrum Center. A lot has been said about the Eagles continuing after the death of founding member Glenn Frey. At first Don Henley said they were done. But with the recruitment of Frey’s son, Deacon, the Eagles were reborn. Having a Frey in the band made the logistics of the band hitting the road more realistic. After a run of well received “Classic” concert appearances, the time was right for a larger scale tour. The Eagles came out to the eruption of a sold out arena. They jumped right into the harmonizing “Seven Bridges Road.” Deacon Frey was introduced as he sang lead on “Take It Easy.” Deacon gave a powerful performance chan neling his father. For “Witchy Woman,” a brass section came out that added a special Cajun flair. Bassist Timothy B. Schmidt got a chance to shine with “I Can’t Tell You Why.” He came out on crutches and stayed seated the whole time. Word going around is that Schmidt fell in the shower last month. As usually, Joe Walsh was a monster on guitar. Walsh also got to sing lead on “In The City.” Later in the set, he performed his solo material: “Life’s Been Good” and “Rocky Mountain Way.” He did perform some James Gang material too: “Walk Away” and “Funk #49.” Gill did get to perform his solo tune “Next Big Thing.” Henley did not perform any of his solo material. Walsh and guitarist Steuart Smith both got their talk boxes cranked up for the heavy “Those Shoes.” After the end of his solo, Walsh broke a guitar string. Walsh held it up proudly displaying it to Smith and the entire crowd. Speaking of Smith, he was an unsung hero all night long. He quietly stayed on his side of the stage sharing lead guitar duties with Walsh. They closed the set off with the fast paced “Life In The Fast Lane.” Everyone jumped out of their seats to get in on the action. For the encore, Smith came out with a white double neck guitar. A haunting trumpet solo played them into “Hotel California.” Henley’s vocals were spot on as he sang from behind the drum kit. Walsh and Smith performed the legendary dueling solos to perfection. For the second encore, they performed “Rocky Mountain Way” and “Desperado.” Henley, who appeared front and center, was illuminated under a spotlight as he gave it his all. He grabbed the mic and belted out with passion. The Eagles are back and sounded great. The acoustics in the Spectrum Center were splendid. It appears Gill and Deacon Frey brought new life to the Eagles. It was amazing to see how many notable songs they have in the two and a half hour set. It was kind of somber at the beginning, but as the show went on, you could feel that the Eagles are in good hands now.